Wanted : T2 / r3 = … ? 2. 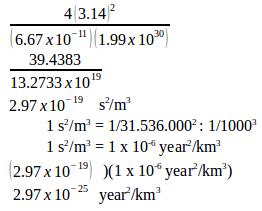 Universal constant (G) = 6.67 x 10-11 N.m2/kg2 and Sun’s 1.99 x 1030 kg. 3. The mean distance of Earth from the Sun is 149.6 x 106 km and the mean distance of Mercury from the Sun is 57.9 x 106 km. 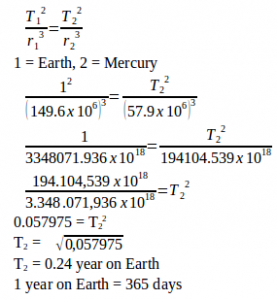 The period of Earth’s revolutions is 1 year, what is the period of Mercury’s revolution?